Just look at what our leaders offer as a “solution”? To solve a private debt crisis they have not only shifted the burden to the state but have also tried to create massive stimulus programmes which have further increased that debt. They tell us that if we hold tight for a few months or at most two years then all will be well and “the system” can return to normal. There are only two things wrong with this. One is that it is a lie. The second is that “normal” has not been that kind to the real creators of wealth - the working class. The bursting of the speculative bubble in 2007 was no surprise to internationalists like us. The only surprise was that it took so long. But let’s not be fooled by tales that this is just a banking crisis which started last year. The speculative bubble was the result of a deeper crisis which began back in the 1970s. This crisis was caused by “the tendency of the rate of profit to fall” which governs capitalist accumulation. In 1945, a devastated world started from scratch and began to accumulate rapidly from a low capital value base. Massive profits were made as the world rebuilt and workers had “never had it so good” (Macmillan 1959). However by the 1970s, the greatest boom in capitalist history was coming to an end. Profit rates were declining and this led to a decline in investment which led to attempts to cut wages. This was done not only by direct attacks on the wage packet but by states printing money to make up for the lack of investment. The result was massive inflation on a global scale. 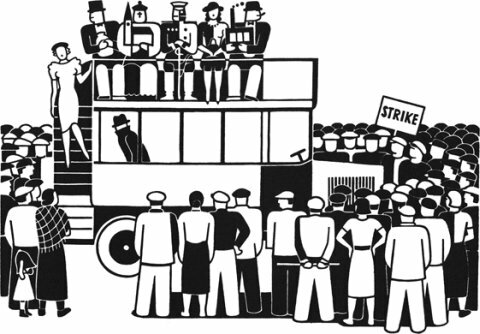 From Buenos Aires to Barcelona, Glasgow to Gdansk, workers fought back and began to strike in their thousands around the world. For over a decade workers fought to defend their living standards but in the end they were beaten. Unemployment first destroyed the cohesion of the workforce and made it easier for the bosses to impose wage restraint (i.e. wage cuts). Then came globalisation. What this meant was the smashing of the working class in the older capitalist centres and the super-exploitation of workers in the so-called “emerging markets”. Manufacturing industry which had been seen as the backbone of any real imperialist power was now transferred from the high wage economies of the G7 and other states to the special economic zones of Asia and Latin America. In the rich countries working class wages declined so rapidly that families could now only exist on two wages coming in. Even then, the working class here could only survive on the basis of the low-cost commodities produced on the ultra-exploitation of the cheap labour of “the emerging markets” (some of which like Brazil have been emerging for nearly 200 years!). But the central contradiction of the capitalist system still remained. The tendency for profit rates to decline forces the capitalist to invest in order to maintain a higher rate of profit than his/her rivals. For the capitalists to carry on investing they have to force down the wages of workers. But in doing this they reduce the ability of workers to buy the goods which are being produced. And, as Marx noted, when they no longer find it is worth investing in new productive capacity the capitalists increasingly turn to speculation. With the working class in the main capitalist countries depleted and defeated, while their counterparts in the “emerging economies” were being exploited to the bone, the capitalist neo-liberals could claim that the “free market” worked. This message seemed to be underlined by the collapse of the state capitalist command economies of the former USSR empire. Now deregulation was the name of the game. Massive capital speculation began to gradually develop in the financial centres like New York and London. Hardly a year went by when some parts of the old state regulation of the financial system, set up after the Wall St Crash of 1929 was not dismantled. In the US, the last bulwark against the use of ordinary deposits for commercial speculation was removed in 1999 when the Glass-Steagall Act of 1933 was repealed. This now allowed ordinary commercial banks to open up investment arms. What they were investing in was debt. Despite a series of scandals (from the Savings and Loans debacle through the dot-com bubble to Enron and many more), which might have alerted the world to the fairy tale nature of this “investment”, the instruments of fictitious capital simply got bigger. After 1999, they took off exponentially. The whole thing was based on asset inflation and debt which would have taken 250 years of world production to pay off. As we (and others) warned for years the whole thing was unsustainable. The crash was inevitable and worse is still to come in 2009. In the summer of 2008, when the speculation bubble in housing in the USA and parts of Europe burst, what was the response of speculators? To invest in commodities like oil and wheat. The result? Massive hikes in prices to the point where even the United Nations Food Programme ran out of money and today is still 18 million tons of food short for its relief programmes. But it won’t just be the marginalised poor of the world who will suffer. The working class everywhere is already under massive attack. In some places migrant workers are simply thrown out of work, their wages unpaid. In China, rural workers have no rights of any kind in the cities where they work so they are being expelled en masse. The same can be said of migrant workers everywhere. The cancer of unemployment is eating away at the working class all over the world. Millions will lose their jobs in the next few months. In the “advanced” countries, workers have seen their pensions robbed and the spectre of homelessness hangs over even greater numbers than the thousands already in the “Tent Cities”, the new “Hoovervilles” of the USA. Even in Japan, which has just seen the largest fall in GDP in its post-war history, people are erecting tents on the streets. Health, welfare and education “reforms” are intended to cut the “social wage” in these places and real wage cuts are already widespread. And when unemployment, starvation, homelessness and wage cuts do not revive profitability, the “final solution” capitalism offers is the mass slaughter of imperialist war. By destroying huge amounts of value (along with the workers who have produced it) capitalism might start to accumulate again (always assuming the planet survives the next imperialist war). Against the insanity of capitalism, achieving a society based on real human needs will be no quick fix. But as there is only one international collective producer class, it can only be achieved if it is led by the working class. It is already 161 years since The Communist Manifesto first announced that capitalism was not the “end of history”, was not the finally discovered form of wealth creation. Throughout its history, from the June Days of 1848, through the Paris Commune of 1871, to the wave of insurrections and revolutions which brought about the end of the First World War, the working class has shown itself ready to fight for a better world. These efforts have been defeated and repeatedly diverted into the Keynesian cul de sacs of social democracy and into Stalinist state capitalist dead ends. Nowhere have we yet overthrown the basic relations of exploitation of the capitalist system but this new and historically unprecedented crisis once again demands a response. And the fight back is already slowly beginning. Last summer’s strikes and food riots in Egypt have been followed by massive workers’ resistance in China. And the latest response of Greek workers and students to the state-sponsored murder of Alexandros Grigoropoulos is just one more response to a system which has no future. On the tiny island of Guadeloupe the French state (which owns it) has already shot one demonstrator after a five week general strike against reduced wages and higher prices. However the system can withstand riots and even isolated strikes and revolts. What the capitalists really fear is an organised and conscious movement of its wealth creators - the working class. This is why it will go to enormous lengths to prevent such a movement appearing and we have already seen the deliberate creation of false “solutions” to the crisis to try to divert us once again. Left capitalist parties, liberals, trade unions and even fake revolutionaries have put forward schemes which ultimately are all about saving capitalism. Nationalisation is only the swapping of a private boss for a state boss but our exploitation continues. Nationalisation today aims to preserve the national capital (which we created) in the hands of the bankers who blew it. The unions, ever eager to prove their “responsibility”, have already offered to accept wage cuts “in order to save jobs” but such “noble sacrifices” (not shared of course by union officials) have often only postponed the job cuts for few months. Tax cuts are supposed to increase our spending power but will mean further cuts in public services. Even more sinister are the left capitalist politicians (like Barack Obama) who call for tariffs and subsidies and for currency wars. Such policies in the1930s led to a simple decline in trade and even worse - to trade wars that opened the way to shooting wars. All this underlines that capitalism has no economic solution but offers only increasing misery and barbarism. The only solution for humanity lies with the international working class. Our previous struggles have demonstrated that only the working class, a class without a form of property to defend, can liberate humanity from the barbarism of modern decaying capitalism. As Lenin said to Russian workers on several occasions in 1918, “no-one else can do it for you”. Our history also points to how we can do it. Only by creating recallable and mandated strike committees elected by mass assemblies of all workers in any area or production unit can we organise our struggles. These committees have the task of not only leading each struggle but also uniting all struggles at local, regional, national and international levels. These are the forums of our “democracy”. But such mass organisations are still open to perversion by capitalists posing as workers’ friends, as happened with the Social Democratic Party in the German Revolution of 1918-19. Unless the workers take on the fundamental lessons from their own past, the lessons of the crushing defeats as well as the temporary victories, then we will not be able to transform society. These mass assemblies have to be presented with these lessons encapsulated in a programme. Such a programme has to contain a vision of a different society which abolishes class, nations, states, standing armies, money, and the exploitative relationship of wage labour and capital. It will promote instead a society of “freely associated producers” who work for human needs and not for the plutocrats’ profits. This programme won’t fall from heaven but from the conscious efforts of human beings, and in particular, that section of the working class which tries to understand the real significance of all our past struggles. Such individuals have to come together internationally to form a party which fights within the mass organisations of the working class for socialism. This party is not a party of government but a party of agitation, of political leadership of the struggle against capitalism on the basis of that programme. The party cannot, and does not, substitute itself for the working class, even though it must act as is its political guide. Only if the most advanced sectors of the class identify themselves in the political leadership of the party can the revolutionary process run along the right lines. Organisations of both struggle and proletarian political power, as described above, plus the party; this is the “recipe” for the revolutionary victory over capitalist barbarism. Indeed socialism cannot be decreed from above. It has to be the work of the mass of the class. This is the only foundation for a new society in which real equality is the basis of our emancipation.